*We are a real solar company offering solar panel installation in Maricopa, AZ. You will only be contacted by Altnerative Energy, LLC. The average cost of solar panels in Marcopa, Arizona is $14,650. 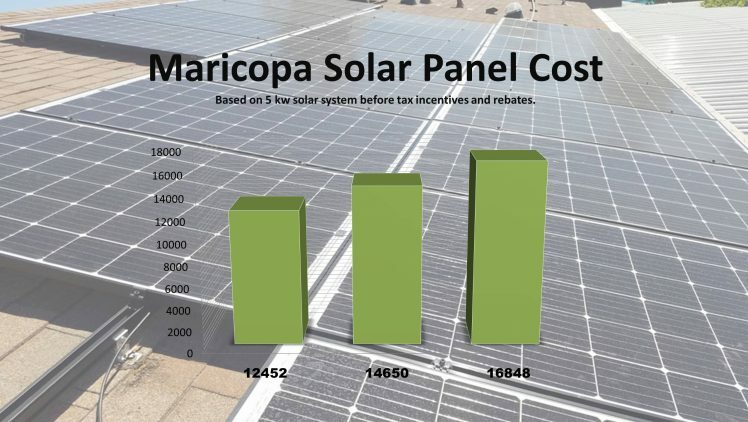 Maricopa, AZ solar panel installation costs ranged from $12,452 to $16,848 in 2018-2019 according to EnergySage. These estimated solar costs don’tt include the Federal Investment Tax Credit of 30% or other local solar incentives. The average solar payback period for solar panels in Maricopa, Arizona took 7.40 years, and the average solar energy savings from solar panel installation was $45,960 over a 20 year period. The average cost per watt is about $2.93 a watt. This study included installation of a 5kw solar system, a slightly smaller system than the average system size for a home in Maricopa. In the future, you could be paying over $.32 cents a watt for electricity in Maricopa. Lock in your electricity rates now at $.6 cents per watt before electricity rates rise again. Learn more about solar cost in Arizona. Use our maricopa solar panel cost calculator to find out your solar system size, how many solar panels you need, total system cost and estimated monthly payment. Alternative Energy, LLC offers affordable solar panel installation quotes in Maricopa and other areas of Arizona. Get a free solar panel installation quote today!